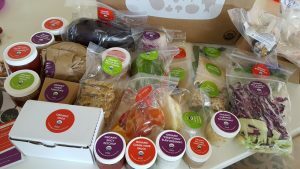 Green Chef is a weekly meal kit delivery service that focuses on a fully organic and healthy menu. 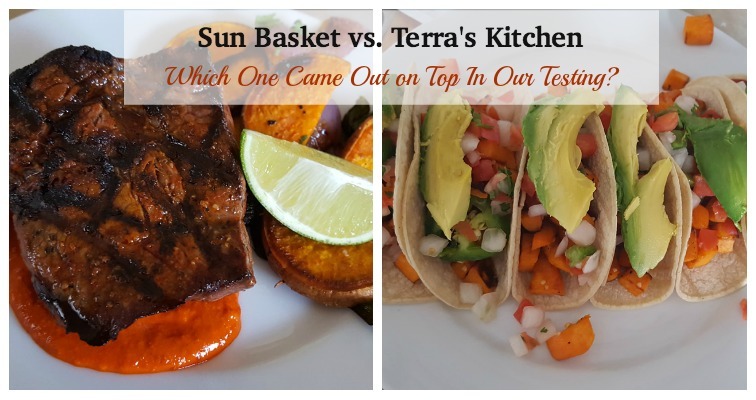 All of their ingredients are USDA Certified Organic and they have meal plans for Paleo, Keto, Omnivore, Carnivore, Vegetarian, Gluten-Free, and Vegan. Their restaurant quality dinners are all pre-measured so you don’t have to worry about measuring, hunting for ingredients, or worrying about finding foods that aren’t easy to find in your local supermarket. 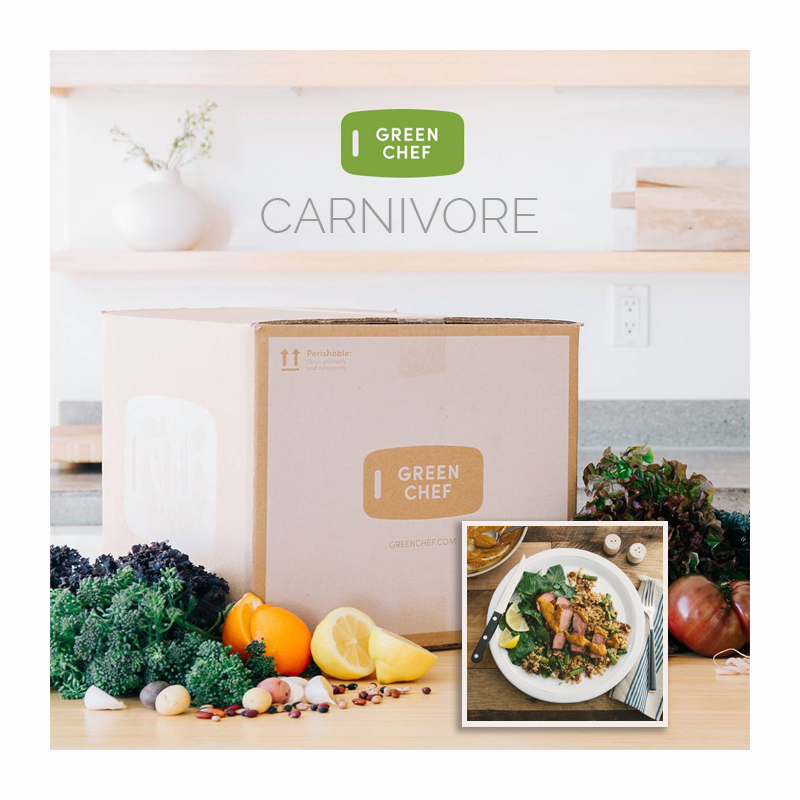 Green Chef is a meal kit that truly focuses on healthy, organic, and unique meals for people of all diet preferences. 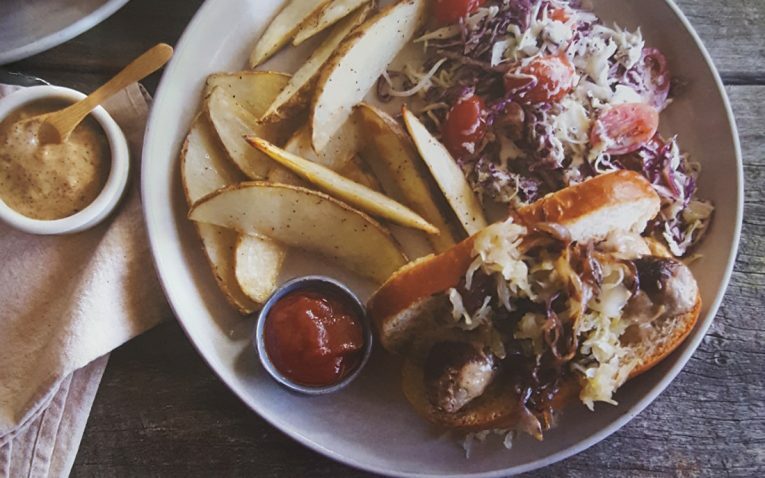 Fresh, organic ingredients from local farmlands designed to suit just about every dietary need. Who Would Enjoy Green Chef? Green Chef is one of a kind because they offer many different meal plan options that include Paleo, Keto, Omnivore, Carnivore, Vegetarian, Gluten-Free, and Vegan plans. 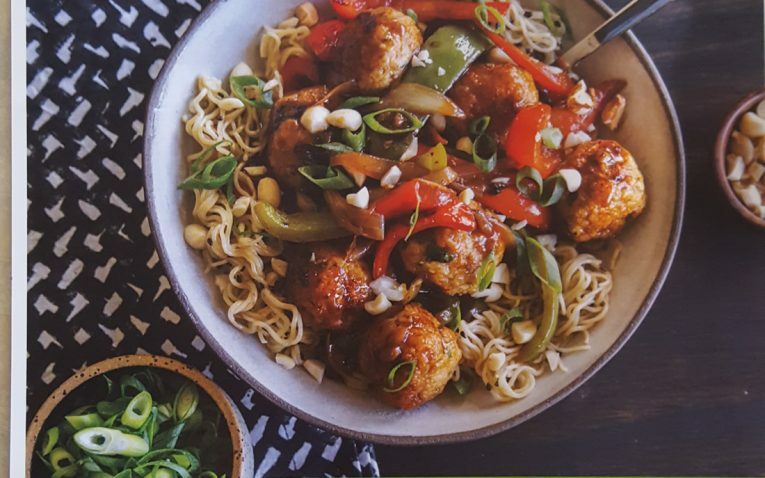 They are the only meal kit service on the market that now has a certified gluten-free menu. All of their meals are balanced and healthy and only use the freshest certified organic and non-GMO produce and ingredients possible. 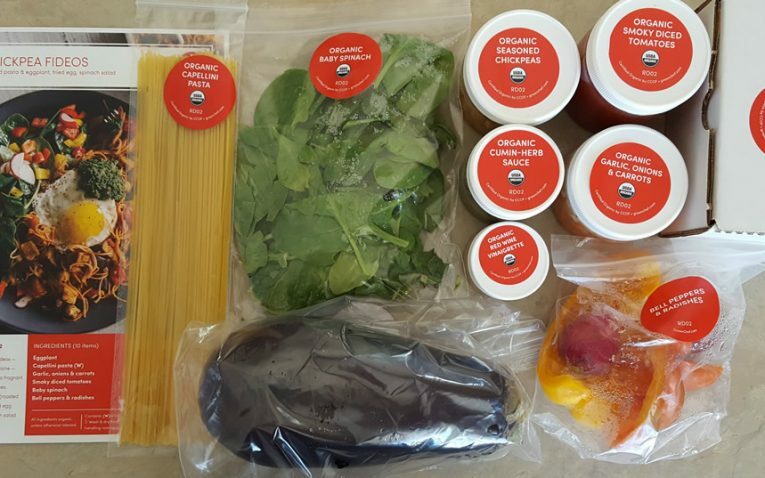 This is huge for people who are committed to an organic lifestyle since most meals kits do not have fully organic ingredients. 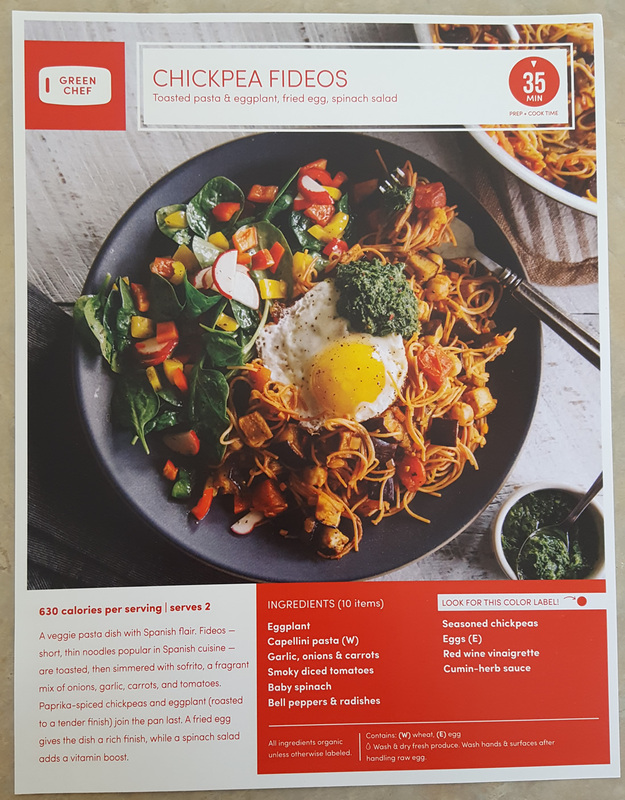 Even though Green Chef has a wide selection of meal plans for all different dietary needs, their major drawback is the fact there are only 3 meals to choose from each menu per week. Therefore, you cannot pick what meals you want from a large list. You are stuck with the meals they give you for that week. If you are not a picky eater this may not be an issue. However, if you are on the pickier side, the lack of choices per week might be a problem. Green Chef allows you-you to skip any week you want, just in case you will not be home or do not feel like receiving a meal kit that week. When you are signing up for your plan you can also choose to get meals every week, every other week, or on a monthly basis. 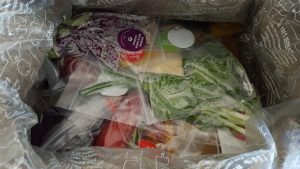 This is a unique feature because most other meals kits only have a weekly subscription option. 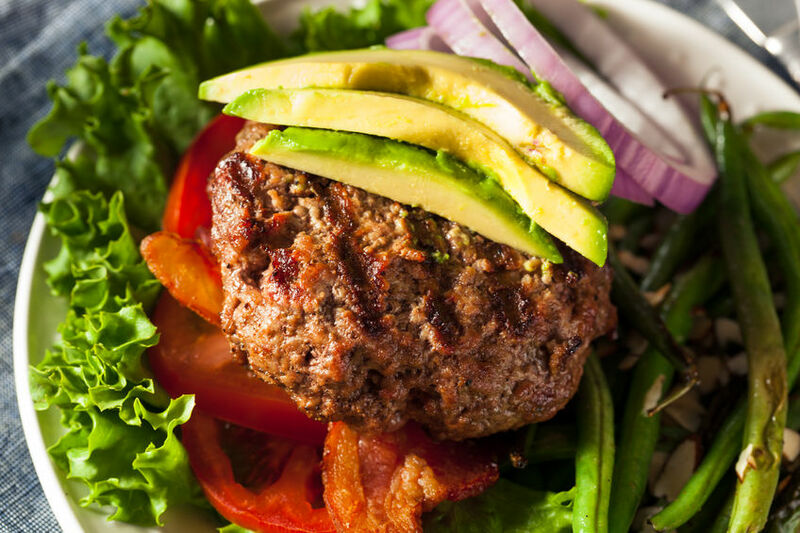 Each week you can also swap from a Paleo to Omnivore or Carnivore for more options. They do not restrict you to just one plan. The drawback of Green Chef comes from their lack of actual meal options once you choose what meal plan you would like to stick to. If you choose the vegan meal plan, there will be 3 menu items for that week and that is the menu you are locked into. You are not able to choose what dinners you will get for that week. 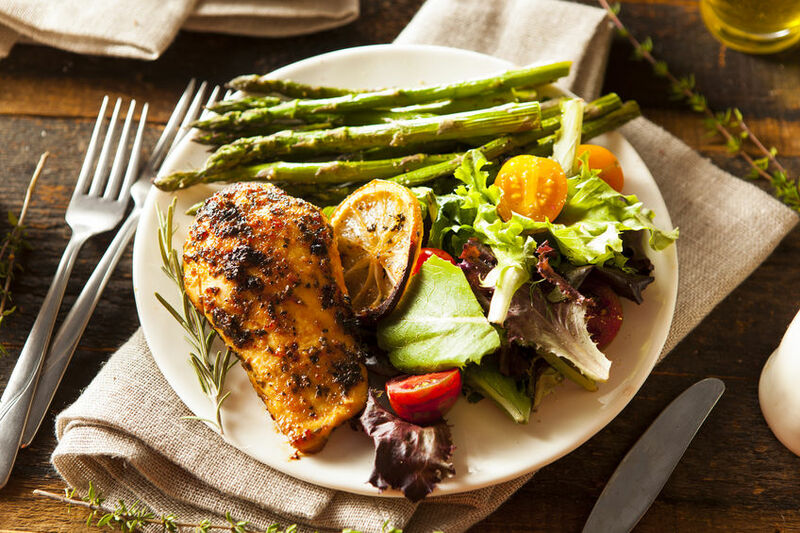 Even though you can switch to another plan such as paleo, you are still stuck with only 3 options – you can't mix and match between plans. Pickier eaters will likely have an issue with this since you cannot pick your favorite meals for the week. 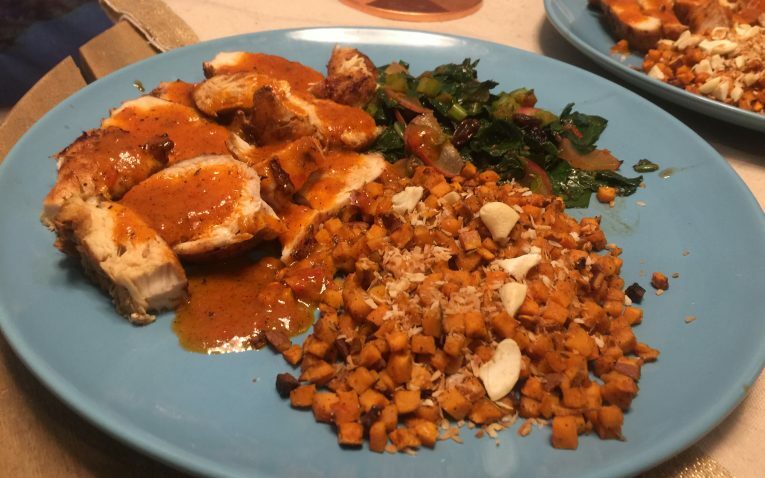 The recipes I got for the week were unique and made me use ingredients and flavors I typically do not, which is what you want when you get a meal kit. They offer familiar ingredients and flavors, but Green Chef is one of the most experimental meal kit services I have used. They really get you to experiment with flavors and ingredients. For example, my favorite dish from my kit were the falafels. Although falafels are relatively common for many people, these are elevated because they are made from sweet green peas and feta. Pairing them with gorgeous red beet and mint couscous, lemon yogurt cause, and kale salad with pistachios, oranges, and dates made for a really unique and delicious vegetarian dinner. 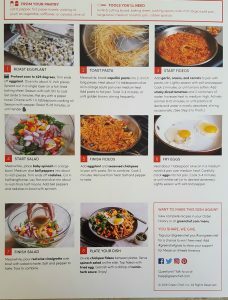 Even though the meals are super unique and encourage experimentation, they will not suit everyone’s taste, especially since you cannot choose the meals you want each week. My boyfriend struggled with the meals a bit since he is much pickier about food than I am. Additionally, the recipes were all relatively similar, so I wish there was more variety. 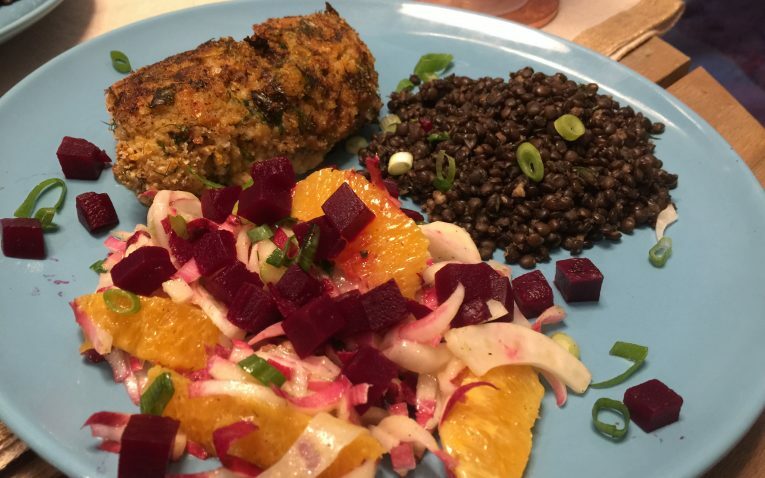 For instance, the falafel dish used beets, green salad, and oranges and the same ingredients showed up in the Herb Crusted Cod. 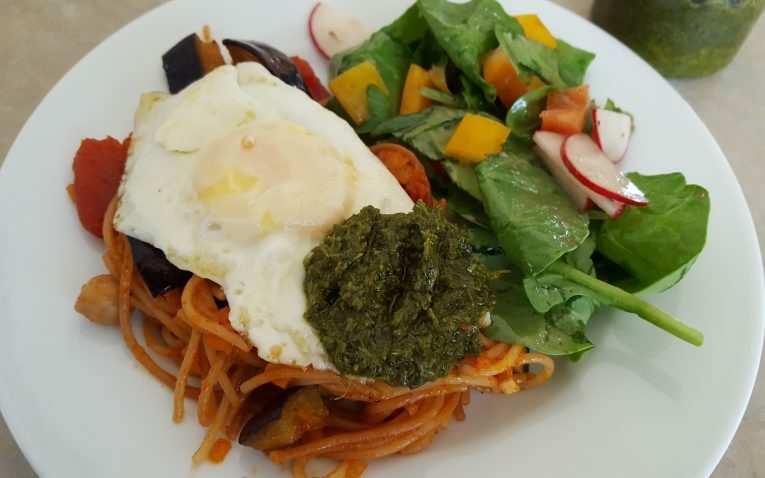 What makes up for the lack of choice per week in meals and some repeated ingredients in the dishes is the fact that Green Chef is truly committed to making healthy and well-rounded meals. 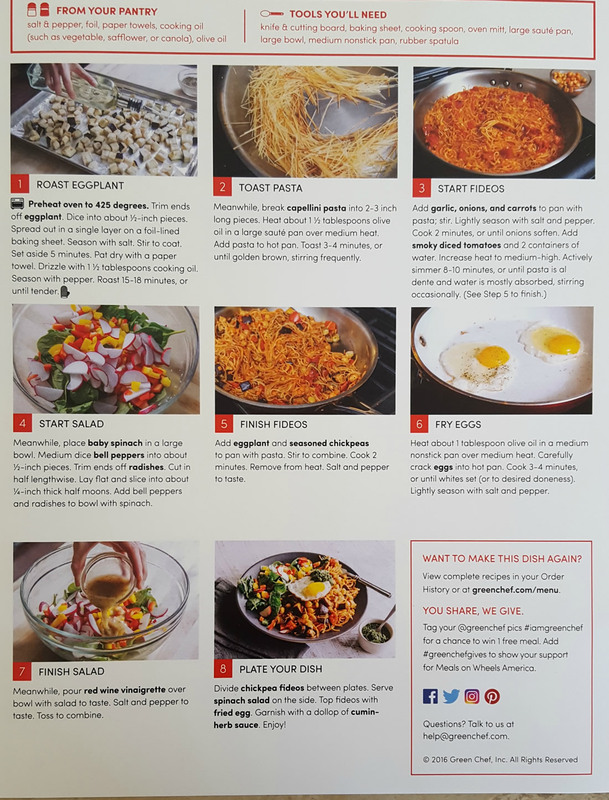 The calorie count of my dishes was quite a bit lower than any other meal kit I have tried and can be easily reduced more by taking out some of the oil they recommend for each recipe. 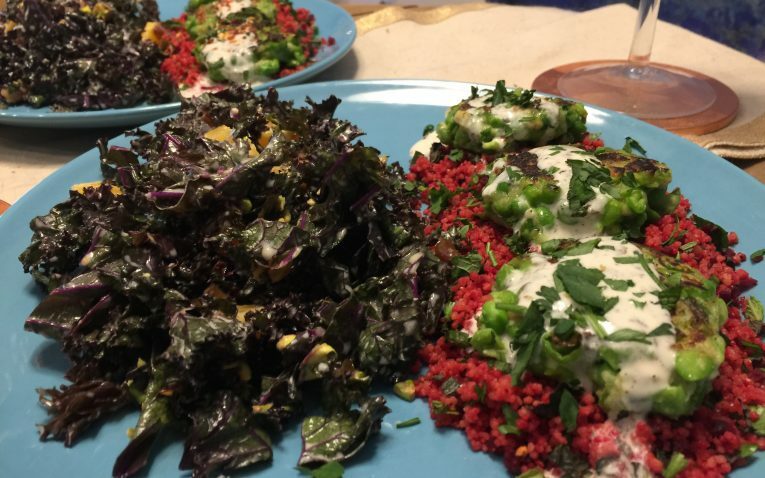 All of the dished included a nutrient dense green leafy salad as well that included ingredients like red kale, collard greens, endive, and fresh fennel. Healthy grains and starches like whole wheat couscous, black lentils, green peas, and sweet potatoes were the perfect addition to each meal. And for me, the best part is that all of their ingredients are certified organic and non-GMO. This is very hard to find in meal kits and for someone like me who is very serious about an organic and non-GMO lifestyle, this is almost unbeatable. The only negative about the nutritional information is the fact they only give you the calorie count on the recipe cards. For more detailed information, you need to go to their website. The following prices are for a 1, 2, 3, 4, person meal plan. Although they will vary slightly, the weekly price will be around $80.00, give or take a few dollars. You pay weekly with Green Chef, so you can cancel at any time. The omnivore, vegan, and vegetarian plans are closely in line with the price per serving for most other meal kits. Although Green Chef is higher in price than many other meal kits, you are getting much higher quality ingredients that are organic and non-GMO, so this may justify the higher price tag for people are passionate about organic eating. Overall, the price is higher than most other meal kits. 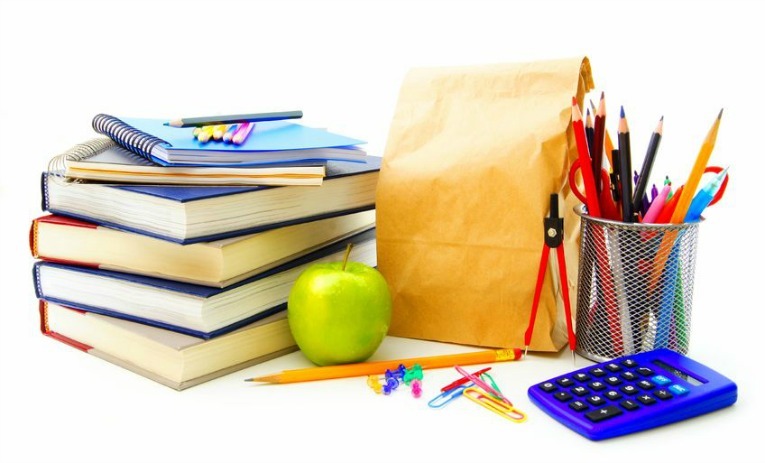 The specialty meal plans are quite a bit more expensive and may not fit the budget for many people. For instance, the Paleo meal plan will run $90 per week. You also need to pay $9 shipping every week as well as it is not included. You are locked into three meals per week (not very flexible here) and you can choose between two, four and six plates per meal. 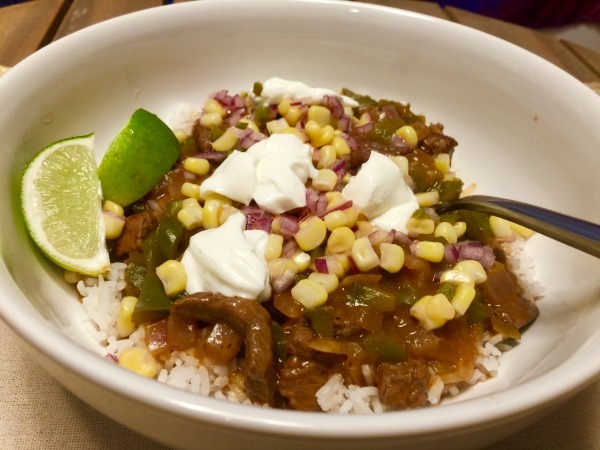 For a family of four on a tight budget, Green Chef may not be an affordable option. 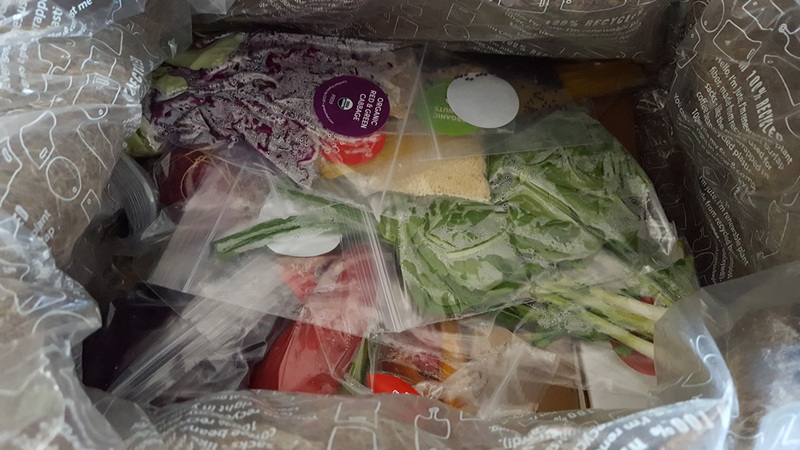 TIP: If you are interested in trying Green Chef before committing to weekly shipments, we suggest you order your first set of meals, and then immediately go in and skip your next shipment. 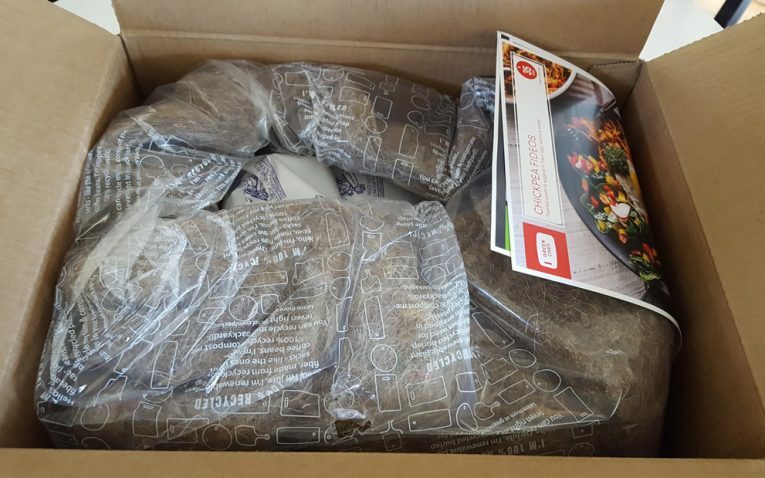 This will give you time to try Green Chef out before being locked into another shipment. We are providing this suggestion because they require a 7 day advance notice to cancel a subscription, and if your box arrives on Friday that means you would have to cancel by noon on Saturday – that doesn't give much time to test anything! You get 3 large recipe cards. The front of the cards has a large colorful picture of the finished dish with cooking time, servings, and calorie count. It also has a little description of the dish, the ingredients you need with exact measurements, what you need from your own kitchen, and if the dish has any allergens. On the back is a series of 7 steps. Each step is bulleted with bolded words they represent the ingredients you need and this makes it easy to follow and pick out ingredients. There are also numbered pictures on the side the correspond with the instruction numbers. 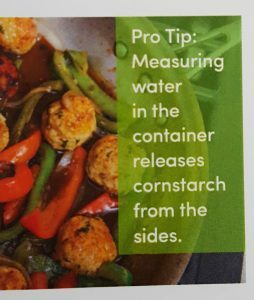 There are also Chef’s Tips in the instructions that clarify steps further if you need it. 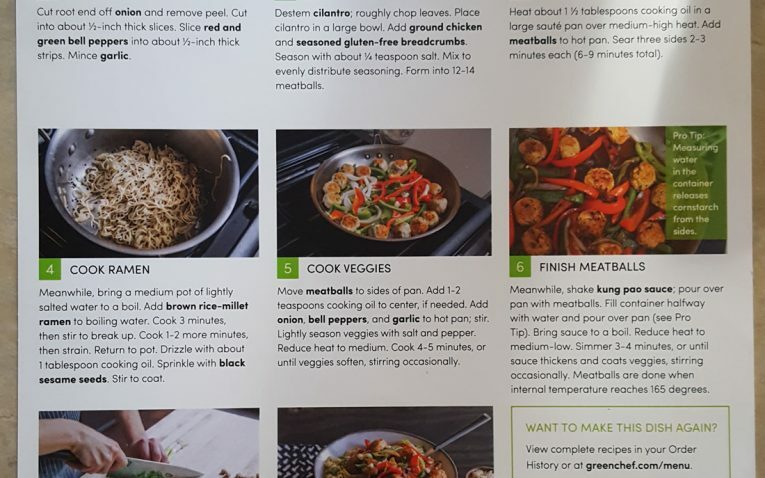 Recipes come with step-by-step instructions and the site even tells you what main ingredients (such as olive oil) and cooking equipment you need prior to ordering. The recipes are designed for the novice – though the ingredients are definitely for the experimental. 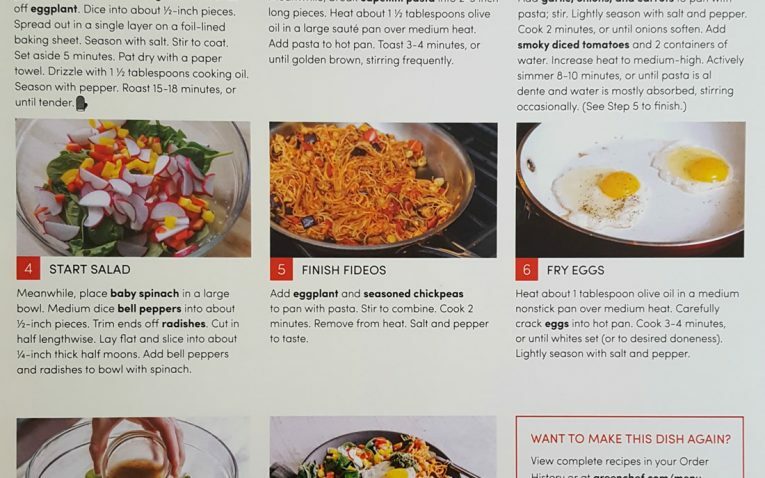 All recipe cards tell you what tools you will need to gather as well as any ingredients you need to supply on your end – such as Kosher salt, pepper and olive oil. Green Chef helps you organize ingredients by color. Each recipe card has a color and you find the ingredients with that corresponding color. The main negative is the pictures are super easy to follow but don’t really show the preparation steps in a comprehensive way. This is not an issue for well-versed home cooks, but true beginners may struggle a bit. Some of the instructions will be hard for new cooks to follow as well. For instance, most new cooks will not understand what zesting an orange is or what segmenting an orange is. Although they do have a Chef’s Tip for segmenting an orange it is not the most descriptive and the picture may not help those who really struggle in the kitchen. The recipe cards don’t have amounts – so if I wanted to recreate these recipes at home, I wouldn’t be able to. This is a big issue for me, because the purpose of these meal delivery kits is to expose you to new recipes and then teach you how to make them so that you can repeat again at home (if you want). When they don’t include ingredient amounts, you can’t exactly do that. 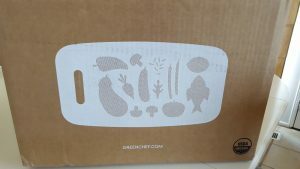 The boxes from Green Chef come clearly marked – so I know exactly what it is. The kit comes in a well marked and insulated box with large ice packs to keep your food fresh. Everything was still perfectly chilled when I got it. It was actually sitting outside my apartment for a few hours and I had no issue. 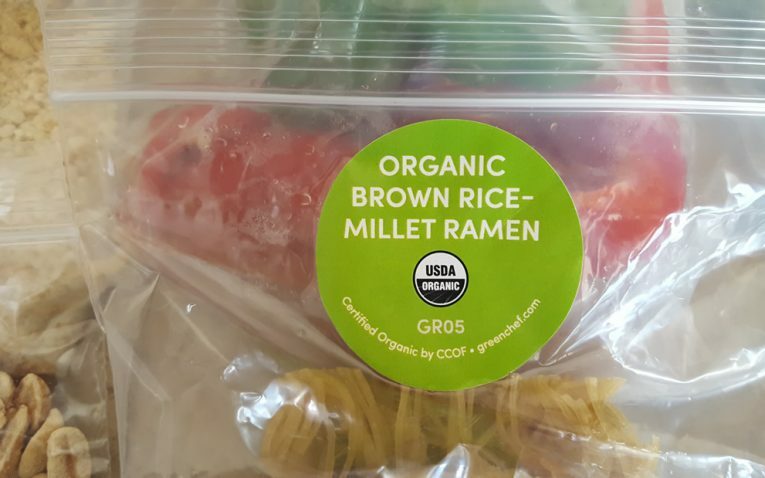 Green Chef sticks with its organic, fresh and sustainable mission by using a recyclable jute liner instead of foam or other non-recycle products. 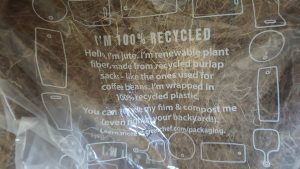 You can even add your jute liner to your compost pile! All of the more delicate items are placed up top – and kept cold by the layer of ice packs on top. All of the items are color coded by recipe card so that you know what goes with what. The only negative was the fact the recipe cards were tucked into the side of the box and were hid by the insulation. I actually thought they forgot to include the cards for me until I took a peak on the side. They should put the cards right on top of the package so it is the first thing you see when you open the box. 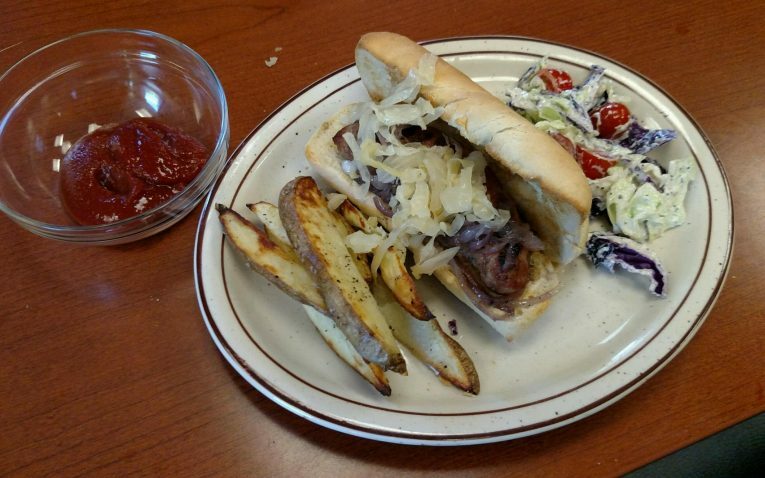 Meals are delivered every week, bi-weekly, or monthly depending on what you choose. 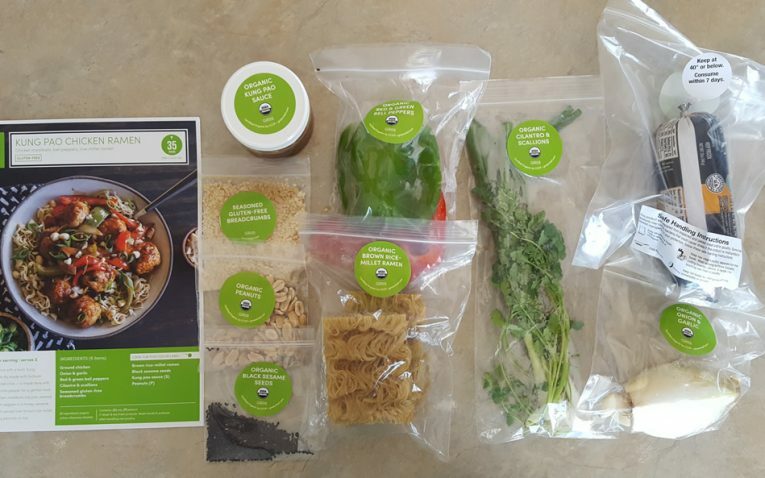 Green Chef packages their ingredients different than other meal kits. 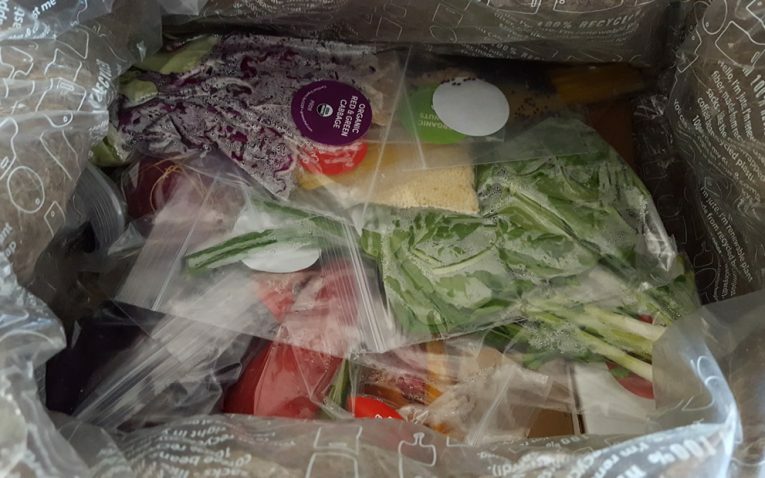 Instead of placing ingredients in boxes or paper bags for each recipe and having all the ingredients together, they have their ingredients separated in color-coded plastic bags that correspond to each recipe. They ship to all states and they ship in the summer as well. Shipping is a flat rate of $9 per order. With how much you are paying for this meal kit service, shipping really should be free. Although they do not have a traditional gifting option there are options for existing customers. You can use the referral and rewards program to send free boxes and special discounts to family and friends so you can earn a credit for yourself. 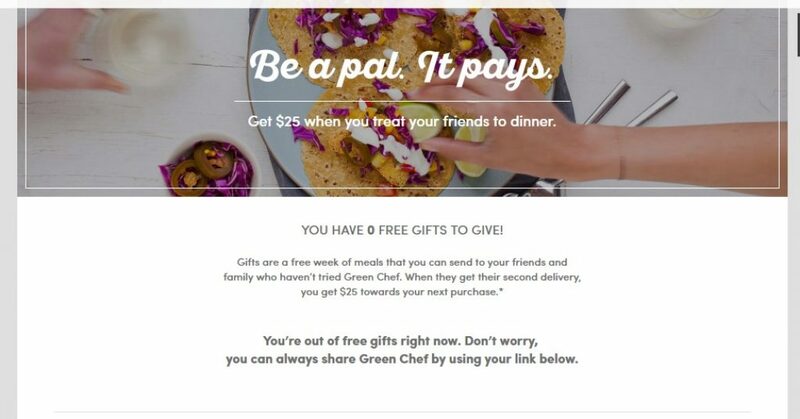 Green Chef does not offer gift cards and they do not have special gifting options available. Green Chef has a phone number, email, and live chat to get into contact with them. Hours are available on their website and are Monday through Friday 7 am to 7 pm PT for the phone. They also have a great FAQs section online and plenty of information about their products, mission and even recipes. I was never able to use their live chat because they were never online, even during business hours. The first time I called Green Chef their phone number just gave me a busy signal, but I was able to get through on the second call. I had trouble accessing my account because it kept saying my password was incorrect. When I tried to use their password recovery tool I never got the email with the link to reset my password. I sent an email to the customer support team to resolve the issue and have yet to get any response back. It has been nearly a week. Overall, customer service is very disappointing. Green Chef offers two, four and six plate meal options with a minimum of three meals per week. You pick a plan based on your dietary concerns and all plans come with a $9 per box shipping rate. Vegetarian starts at $10.49 per meal. 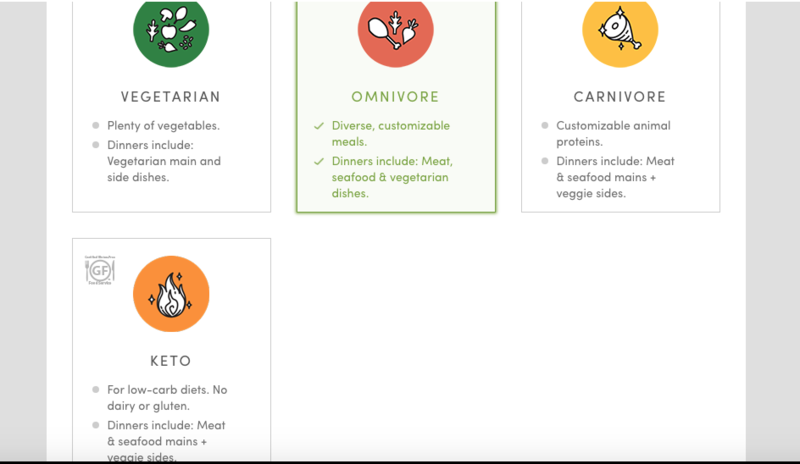 Omnivore starts at $11.99 per meal. Vegan starts at $11.99 per meal. Carnivore starts at $13.49 per meal. Gluten-Free starts at $13.49 per meal. Paleo starts at $14.99 per meal. Keto starts at $14.99 per meal. Take $40 Off first box! Novice. 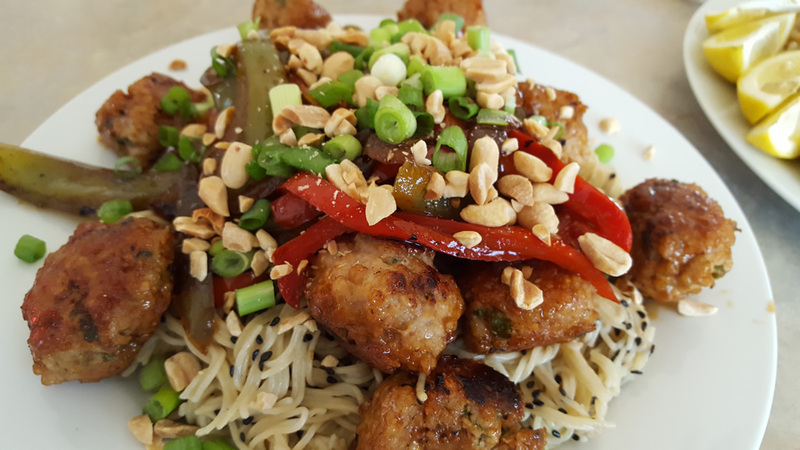 There was nothing particularly hard about this recipe and I am confident even a new cook could make this dish with ease. The only challenging part was smashing the peas with a fork if you do not have a potato masher. Novice. 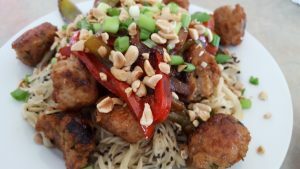 This recipe was super simple as well and most of the ingredients were chopped and prepped for you already. Having the sweet potatoes chopped into the very small pieces for your already made this recipe a breeze. Intermediate. Cooking fish is always challenging, especially if you do not have a meat thermometer. This will be hard for a newer cook. Segmenting the orange is also a more complex skill a beginner will find more difficult as well. 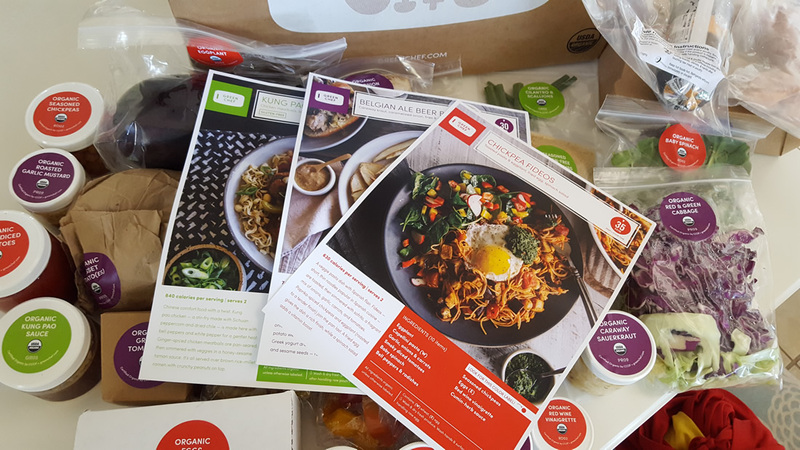 This meal kit service is going to appeal the most to health-conscious eaters who are looking for a meal with very healthy ingredients. Many of the meals are also much lower in calories than other companies. It is also great for people who have specialty diets and need keto, paleo, gluten-free, vegetarian, and vegan options that most other kits do not have. 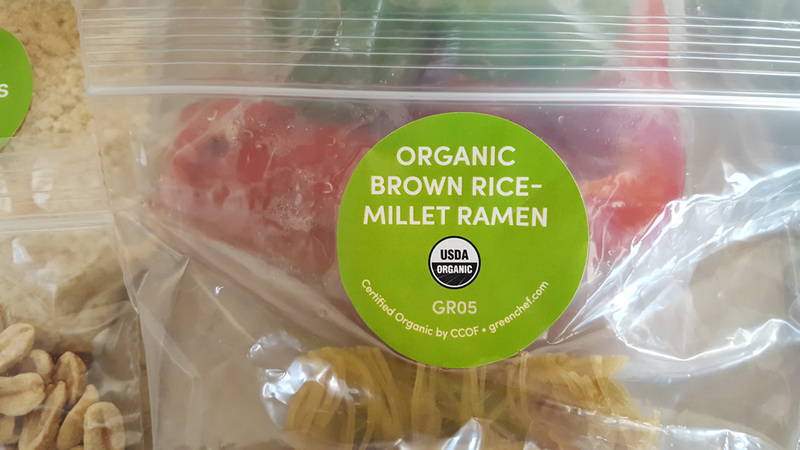 Furthermore, if you are serious and committed to an organic and non-GMO lifestyle, Green Chef’s fully USDA certified organic ingredients is something not easy to find in a meal kit service. 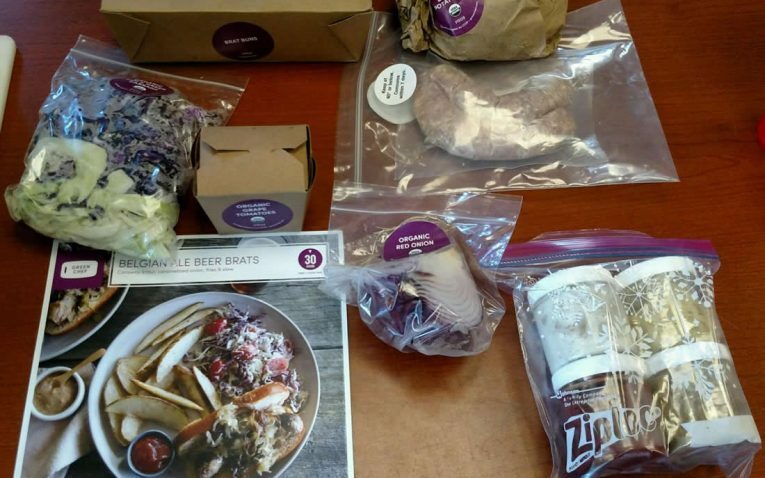 This would not be a good meal kit for picky eaters, families, or kids. 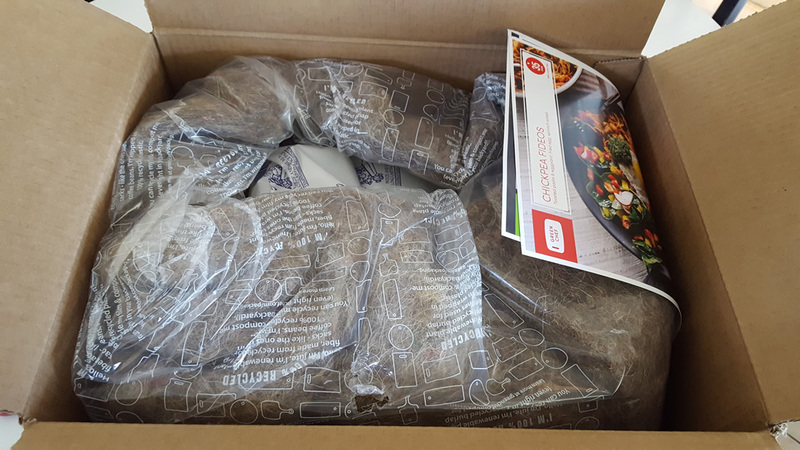 Eco-Friendly Packaging: With home delivery kits, there is a lot of packaging. After all, food safety is of the utmost importance. While Green Chef cares about the safety and sustainability of your food, they also care about the environment. Their packaging is eco-friendly and can be reused, recycled or even thrown into your compost! 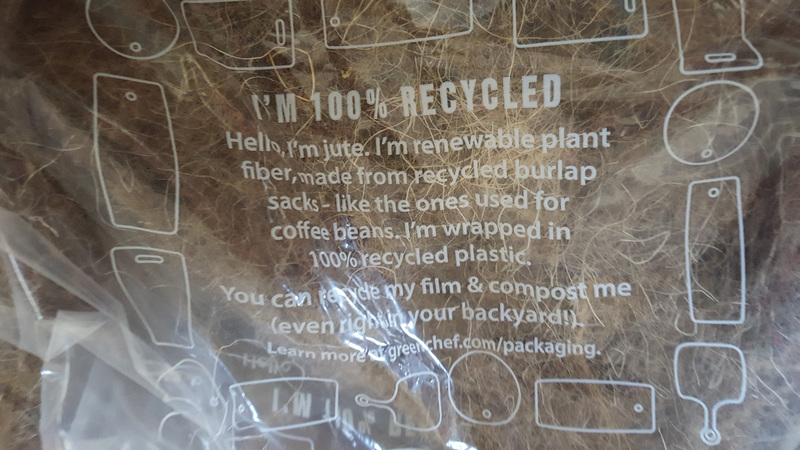 They also list recycling facilities on their website to ensure your packaging does not fill up the local landfill – and we applaud them for taking the extra step here. 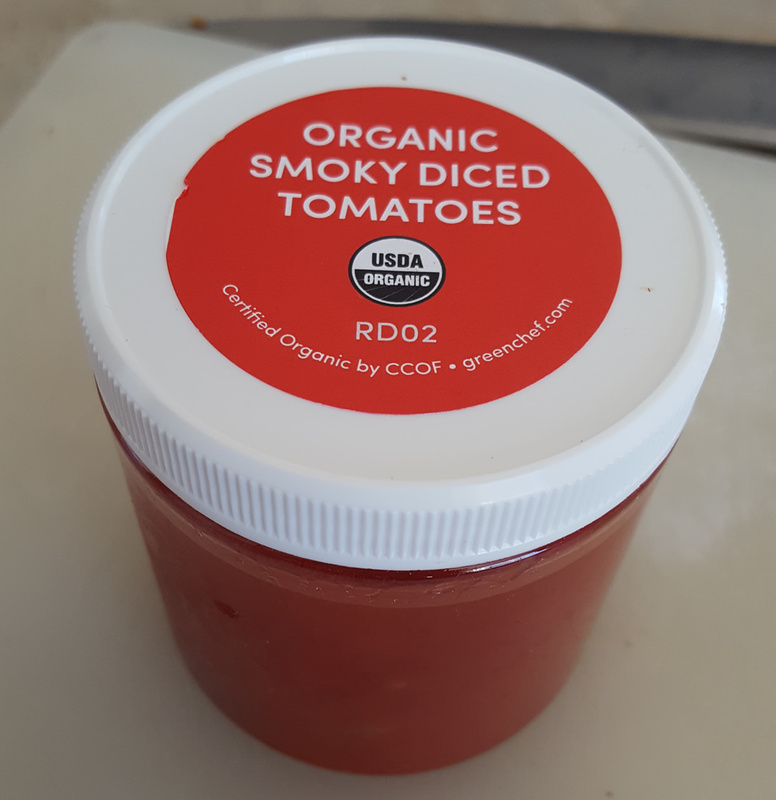 Certified USDA Organic: There is a difference between slapping the term “organic” on your website and having the actual USDA-certified organic promise. 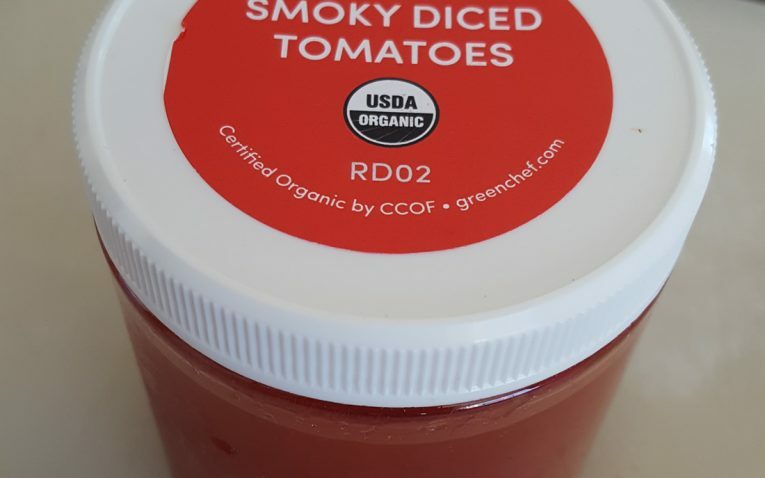 Green Chef sources USDA-certified organic products for their meal kits. Local and Sustainable Products: We really like the fact that Green Chef does not go for the lowest bidder. Instead, they focus on local ingredients and sustainability – you can even check out their suppliers on their website. Referral Credits: Green Chef offers referral credits to their customers. 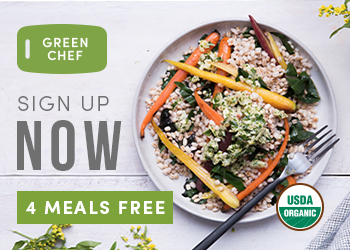 If you refer a friend, family member or even co worker to Green Chef, you will receive $25 to put toward your next meal kit. You can also earn up to four free meals on your first order. 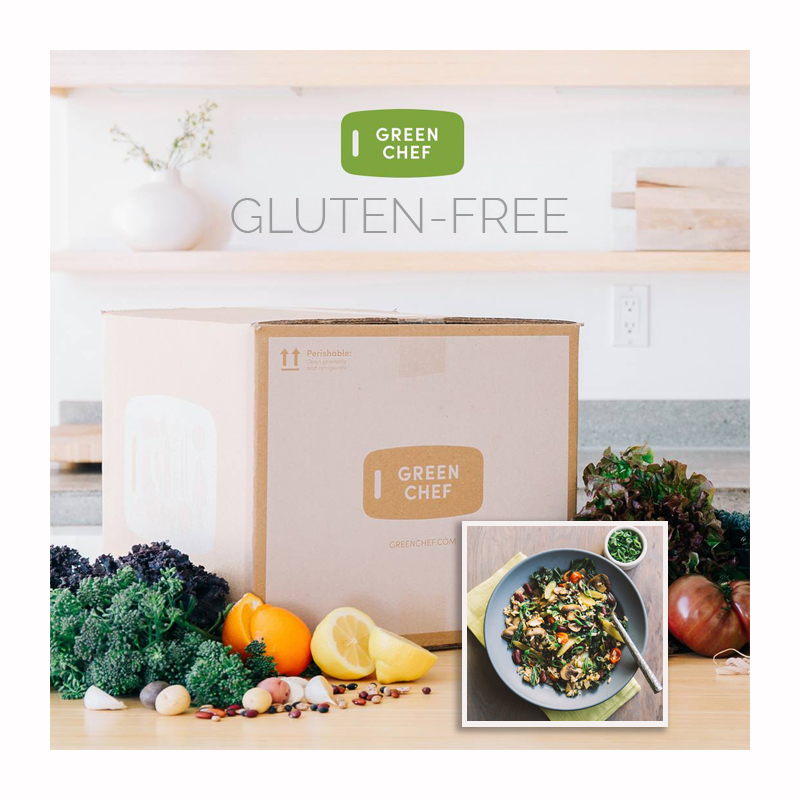 Free Gifts: Green Chef also promotes their long-time clients with free gifts right on the dashboard. Periodically you will see these free gifts – including a code to share a free week of food with a friend. 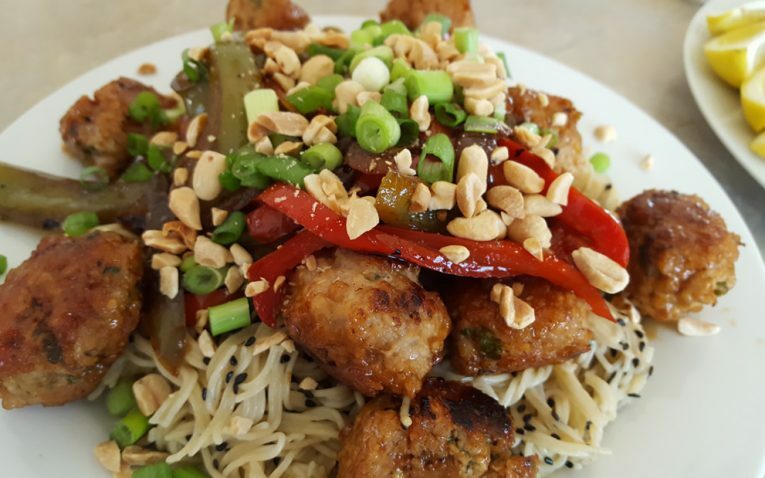 Makes Special Diets Fun: Whether you are a vegetarian, vegan or even on a gluten-free diet, you will not find boring menu options with Green Chef. 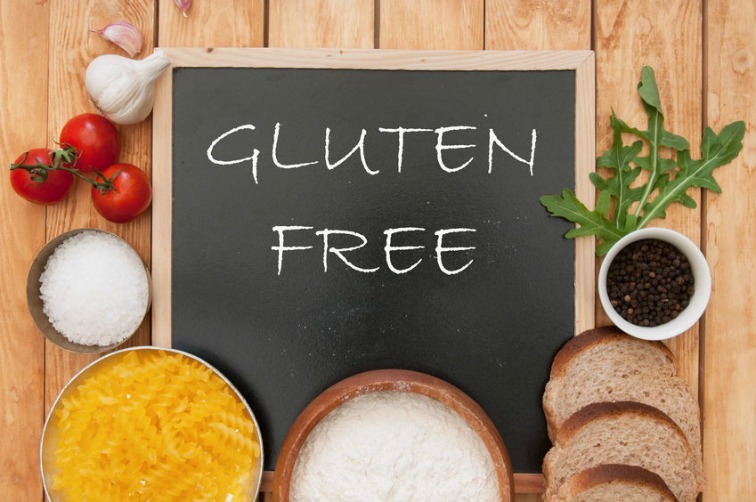 Instead, their recipes are so intriguing, full of flavor and fun, people who normally eat gluten would be tempted to try gluten-free just to explore. We really appreciate the thought they put into their menus – especially for those that are often stuck with generic, run-of-the-mill recipes. No Free Shipping: Unlike other home delivery kits, Green Chef doesn’t have free shipping. We found this a little inconvenient. 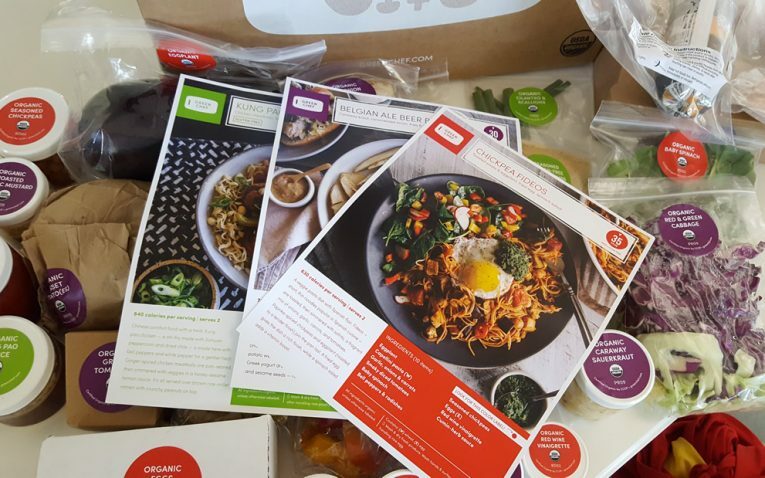 Some companies will charge shipping when your box total is less than a specific dollar amount, but Green Chef is $9 per box regardless and each box holds about six meals. Therefore, if you have multiple meals, you could pay more than $9 in shipping. Higher per Plate Price: When you compare the prices per plate to other companies, Green Chef is definitely more expensive. In addition, once you add in shipping, they become even costlier. 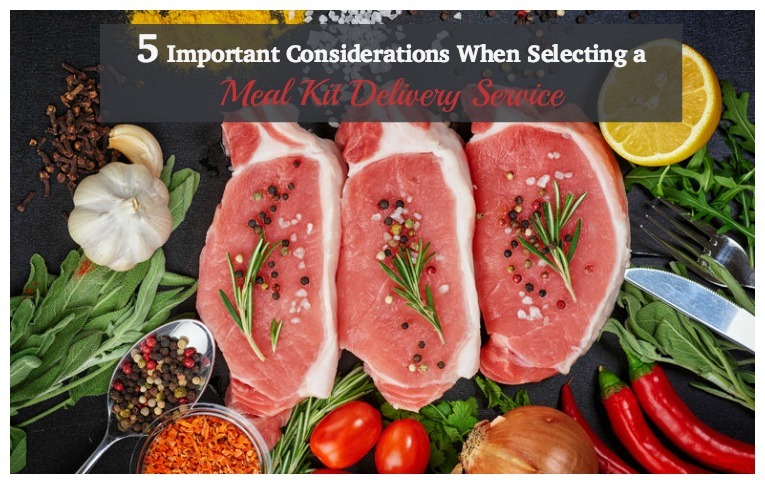 Customization Not Available on All Plans: You cannot customize or choose recipes if you are using one of the specialty diet plans (Paleo, Vegan, etc.). Instead, the carnivore and omnivore plans are the only ones that let you swap out recipes. Overall, Green Chef is a wonderfully healthy and organic meal kit that is great for those who want one of the healthiest meal kit options possible. 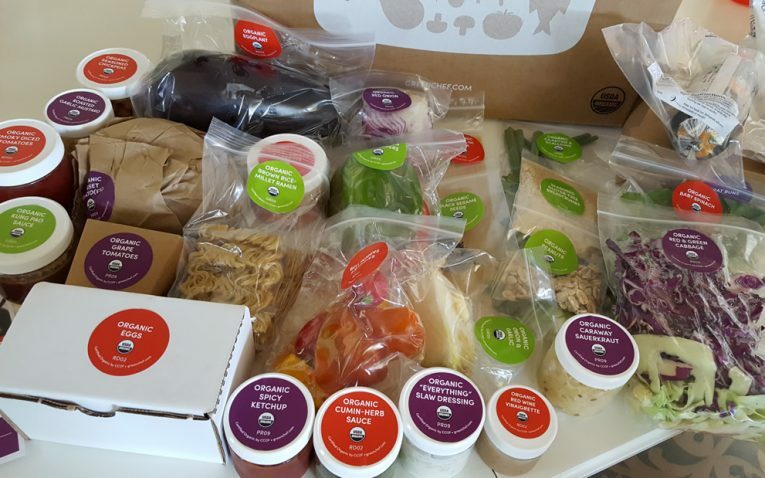 I personally really liked this kit, the food was unique and delicious, and it kits my lifestyle and preferences very well. I would recommend this meal kit to anyone who is not a picky eater, is health conscious, and is passionate about organic and non-GMO eating. I would not recommend this kit for people who are picky eaters, and it is probably not the best options for families or kids. I would absolutely order Green Chef again, however, the high price point would likely force me to do every other week or choose the plan on a monthly basis. $80-$90 per week plus shipping would get very costly. All certified organic and non-GMO ingredients. Able to skip any week or choose weekly, bi-weekly, on monthly subscriptions plans. Only three recipes available each week for the different meal plans (cannot choose your meals). Not suitable for picky eaters. Recipes are more complicated - maybe not suitable for truly beginner home cooks.